Go straight for 250m, and turn right at the Express Bus Terminal 4-way intersection. Continue going straight for 400m and cross the road. Go straight through the underpass to arrive at the park. Walk straight for about 385m until to reach at Banpodaero four-way street, then turn left. Continue walking following the main Banpodaero road for about 530m and go straight through the underpass then make another left immediately. Walk pass the parking lot then you will arrive at the park. Upon exiting, walk 20m to reach at Banpo Jugong Apts. senior citizen community center. Make a short left turn then head straight to the part walking about 900m. Take or get off from these following buses at either Express Bus Terminal Station Bus Stop (right in front of Express Bus Terminal Station Exit 8-1 or 8-2) or Central City Bus Stop (right in front of Express Bus Terminal Station Exit 3). 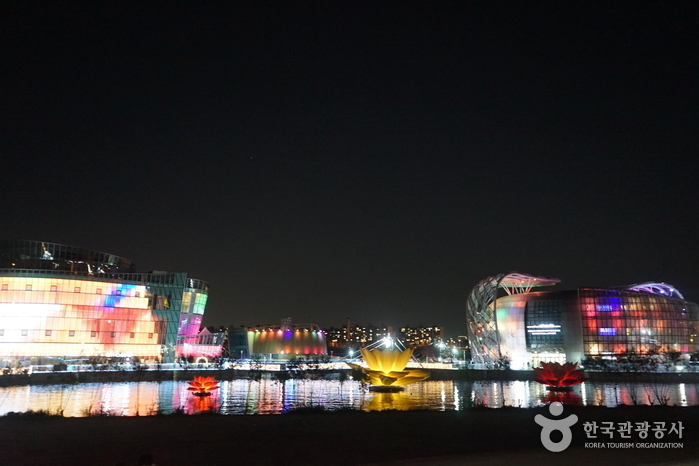 Banpo Hangang Park is located on the southern side of the river centering on Banpo Bridge (Jamsu Bridge) between Hamnam Bridge (upstream) and Dongjak Bridge (downstream). 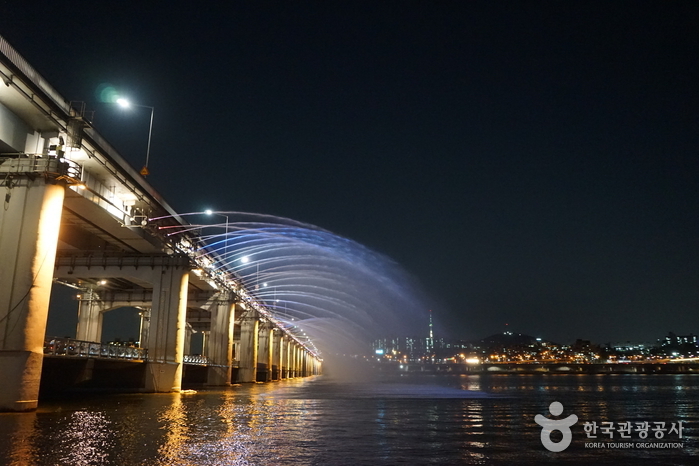 The Rainbow Fountain built on both sides of Banpo Bridge was registered in The Guinness Book of Records in 2008 as the longest bridge fountain in the world with a total length of 1,140m. 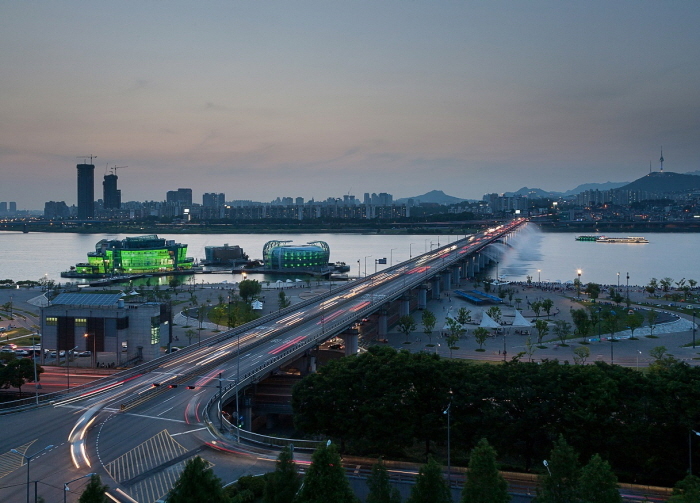 The bridge starts from Banpo Hangang River Park created under the Hangang Renaissance Project. At night, over 200 lights create a fantastic view of a beautiful rainbow. In addition, there are sports facilities including bubble playground, in-line skating track, soccer field, and basketball court. 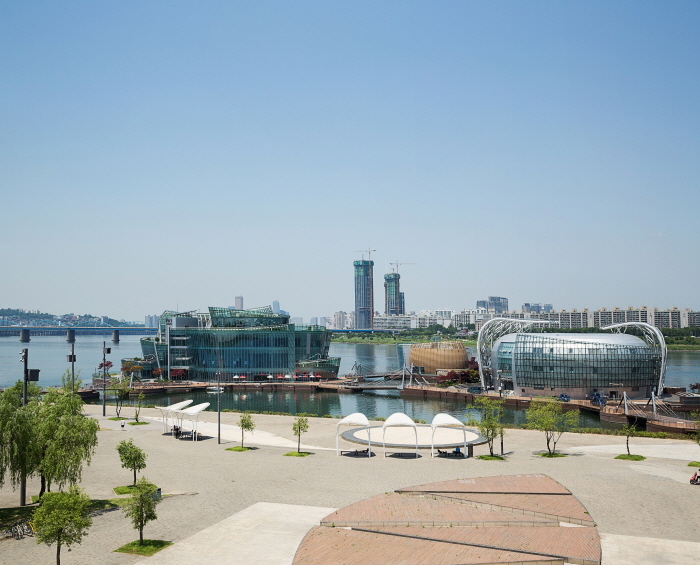 You may also enjoy the gorgeous view of Hangang river and skyscrapers on the riverside from Gureum and Noeul café, lookout places located on the southernmost part of Dongjak Bridge. Seoraeseom Island which connects from Banpo Hangang River Park is an artificially created island to provide a leisure space for Seoul urbanites. Every spring, the place is flooded with waves of canola flowers and people to enjoy picnic and spring events like ‘Searaeseom Butterfly, Canola Flower Festival’. Your joyful experience in the park doesn’t end here - there are more things to see and enjoy including a nature experience field, boat quay, bike lane, and picnic spots.